do you have a tutorial on how you do the line less coloring style? 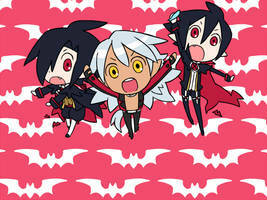 Like always, your dumps are adorable and bring out my fangirl for disgaea..always !! I'm super glad you're still doing these !! I'll happily continue to support your future works and continue to look forward to them ! Is that angel Prinny Big Sister Prinny? By the way this reminds me. Get Disgaea 4 vita when it comes out! I picked up a japanese copy and it is fantastic! If you memorize Disgaea 4 then you don't need to speak japanese to import. I was a fool to do so. despite the fact that my hours of resetting will be in vain when the english version is released. Is it just me or was D4 revisited the absolute worst SE that NISA has ever made? A poster, a cloth and 3 keychains that are really just tiny posters. PS: I'm still kinda mad at you guys about the Valvatorez pillow. That is some amazing sketches! I like it! and the prinnies lining up for valvatorez.